Korumburra Shire (1922-94), west Gippsland, was in hilly country south of the Princes Highway. Its administrative centre, Korumburra, is on the South Gippsland Highway, 110 km south-east of Melbourne. Korumburra shire began as the Poowong and Jeetho shire on 29 May 1891 (see separate entry), and adopted the name of its main town on 25 October 1922. The shire offices had been at Korumburra since 1908. The creation of the shire coincided with the extension of the Great Southern Railway (Gippsland): Tooradin to Loch (1890); Loch to Korumburra (1891) and Korumburra to Leongatha (1892). The railway extensions also coincided with the opening up of dairy farms and favourable reports of coal deposits south of Korumburra. The coal was important for both rail locomotives and for town gas. 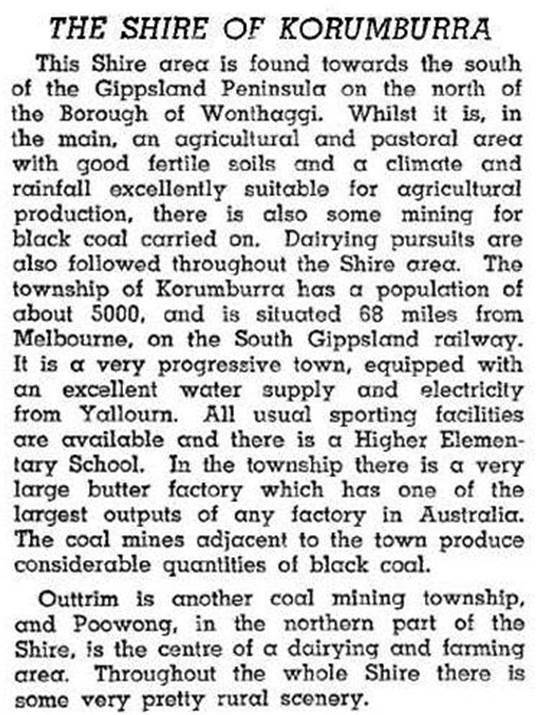 Mines opened were: Coal Creek, Korumburra (1892), Jumbunna (1894) and Outtrim (1896). A railway branch from Korumburra was completed in 1894 (Jumbunna) and extended in 1896 (Outtrim). All this activity, along with the opening of a dairy factory in 1900, made Korumburra a rapidly expanding town. From 65 people in 1891, it had nearly 2500 in 1901. The Great Southern Railway passed through all but two of the shire’s main towns, Nyora, Loch, Jeetho and Korumburra. Poowong and Kongwak were the exceptions. By 1900 there were six dairy factories: Poowong, 1892-1986 (taken over by Drouin Co-op), Moyarra (near Kongwak), 1892-96, Bena, 1893 – rebuilt 1901-42, Kongwak, 1896-1963, Loch, 1900-11 and Korumburra, 1900-75. The shire got off to a flying start. It began with 390 sq km, acquired part of Woorayl shire (Leongatha) in 1893 and the area around Kongwak in 1898, giving it 570 sq km. Its population was 7900 in 1901, a figure not exceeded until 90 years later. Early population losses are explained by the decline of the coal towns and the failure of small farms. Dairy farming continued to be the leading rural activity, but all the produce was processed outside the shire after 1975 when Korumburra’s factory closed. Closure was keenly felt, just as was municipal amalgamation in 1994: Leongatha had come out in front in both contests. Most of Korumburra shire was amalgamated with Mirboo and South Gippsland shires and most of Woorayl shire to form a new South Gippsland shire in 1994. In that year Korumburra shire had 46,350 dairy cattle, 49,500 meat cattle and 15,600 sheep and lambs. Farm land occupied 91% of the shire’s area, and 77% of the farm land was sown pasture.